On the script page, “She dives through the air and PHASES through multiple floors” seems simple enough. To the trained director, line producer or VFX supervisor, these words are a nightmare. 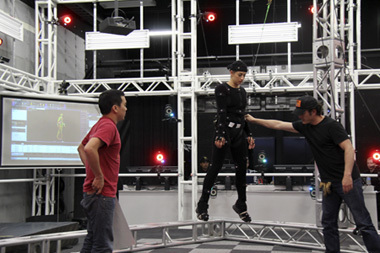 In Eric Furie’s CTAN 565L class, Motion Capture Performance, these words were a challenge, but not impossible thanks to the technology in the Robert Zemeckis Center’s Motion Capture Stage. On March 15th, Furie’s students suspended an actress from a trapeze rig to capture an action sequence as part of a student's final project. The sequence involved the help of Bill Leaman's stunt team and was captured by the motion capture lab’s 46 cameras. The stage is in the top ten in terms of Vicon cameras and is available for use for students in all of SCA’s divisions.